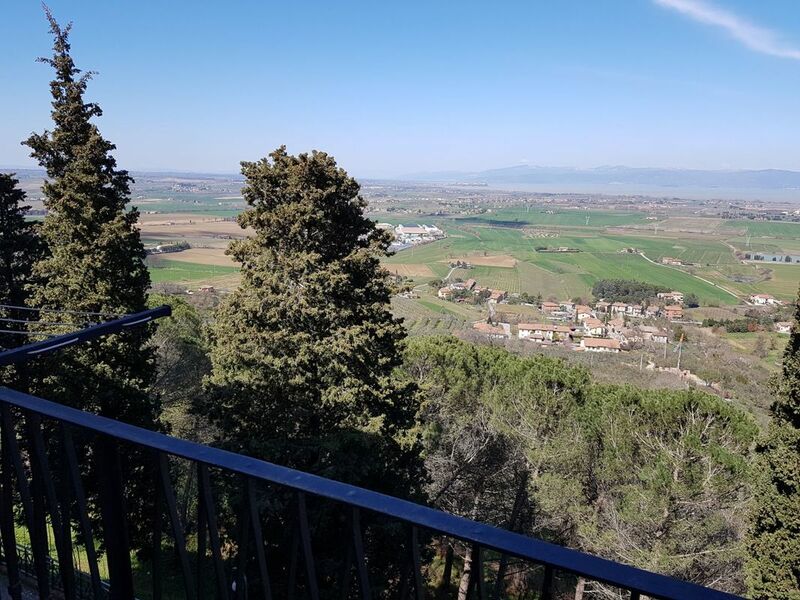 In one of the most desirable parts of the charming hilltop town of Panicale, sits Isabella’s View Apartment, which boasts spectacular views of Lake Trasemeno and the valley below, promising a true Italian deam holiday. ​Only a few steps from the main Piazza Umberto I, this romantic and therapheutic apartment will steal (and heal) your heart the minute you arrive. ​On one of the most colorful yet peaceful streets in the old town of Panicale, just off the main Piazza and yet blissfully quiet, you can easily access the apartment and within minutes be sipping a glass of local wine in one of the excellent restaurants or bars, which are only minutes from your front door. Similarly you have easy access to the local shops and their traditional produce around you. Isabella’s View Apartment is newly restored and yet totally original in structure, having been built into the ancient walls of the town. It has the rare benefit of access via an elevator, which makes the apartment suitable for all ages. This romantically designed two bedroom apartment, with 2 full bathrooms with showers, has everything you need to settle into a perfect vacation in Panicale. Whether you are coming for a few days to explore this delightful medieval town, or plan on staying longer to really immerse yourself in the Italian lifestyle, this apartment has everything you need. You enter up a small flight of stone steps (or take the elevator) into an atmospheric and high-ceiled hallway with original exposed walls stones. The welcome continues as you move through one of the traditional doorways into the dining room. The living room is spacious and enjoys a spectacular view of the lake. It has a comfy sofa, TV, with a door leading outside to the balcony where you can sit in absolute tranquility and enjoy the view with a glass of wine and perhaps a good book. ​The custom kitchen is a perfect size and comes equipped with a dishwasher, stove, oven, toaster, microwave, american filter coffee machine, kettle, fridge/freezer and combined washing machine/dryer. It has lots of counter space where you can practice your pasta making skills or just whip up some antipasti made from the fresh ingredients you picked up at the weekly farmers market. Also off the hallway are the two double bedrooms, the first with chandeliers, wardrobes ,large window with traditional shutters and a splendid view of Lake Trasimeno. This room has its own brand new ensuite bathroom complete with glass walk-in shower. The second double bedroom, with wardrobes and large window with traditional shutters, also comes with a splendid view of Lake Trasimeno. Another separate full bathroom, with individual shower is located off the main living area. I love this apartment because of the location, style, view, comfort and price. It is the perfect choice for up to 4 people for either a short or long stay in Panicale. Panicale is a magnificent Etruscan hilltop town, with a history older than Rome itself. There are excellent restaurants, bars, shops, churches and festivals to keep even the most active traveller busy! But if you are like us, it will be the views, the wine, the food and the warm, welcoming people, that make Panicale truly magical. We hope to welcome you in Panicale soon so we can watch you fall as madly in love as we did. I’m always looking forward to hosting great people. Email me if you have any questions at all! I’m here and happy to help.